Is a tool used to share Internet connection from a PC server to the PC Client. The choice between the Hub / Switch / Router connection is determined by the ability to generate, and of course be adjusted with the available funds. In our case study this time I will use the switch as a shared Internet connection. Modem is a device that is used as a link from a PC or network to Internet Service Providers (Internet Service Provider / ISP). 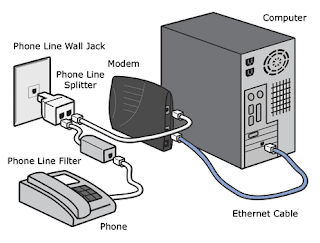 The use of modem that will be discussed this time are the type of ADSL modem. Modems are typically used by ISPs Telkomspeedy. For this type of ADSL modem itself may be selected based on need. This time the author takes the example of ADSL LynkSys AM 300 who only had 1 (one) just as Dialup Device port.